When has this ever happened? I can answer you! Yeah. This IS in order to make up for my absence, my latest colored piece! I personally like this on drawing of mine quite a lot, actually! 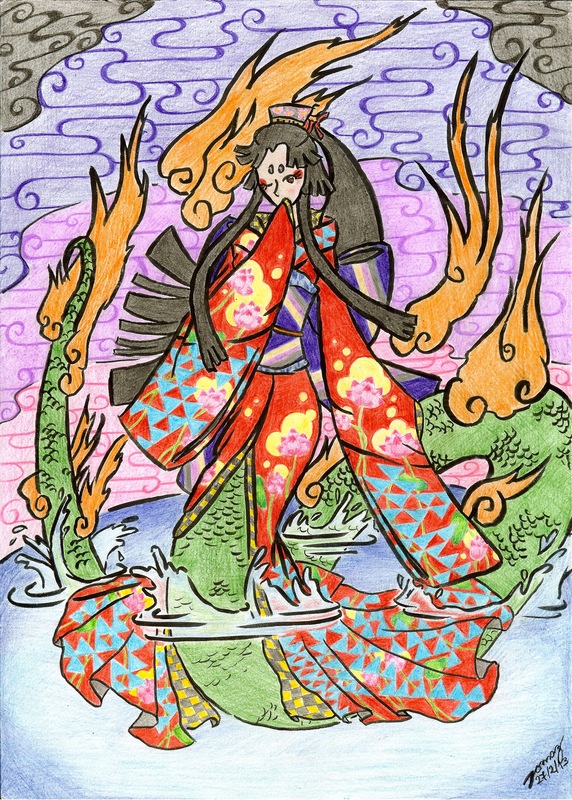 My inspiration for this work was based on Kiyohime, from a so-to-say legend and the inspiration to piece Noh piece "Doujouji". Briefly speaking, she is the beautiful daughter of a rich merchant, and falls in love for a monk, named Anchin, that is passing by her house on his way to the nearby temple Dojouji. After he heartlessly dumps her, she gets angry at him and decides to chase Anchin. As he reaches the Hidaka river, he asks the boatman to cross him, but to not allow Kiyohime on. Blinded by her fury, she decides to swim across it. In the process of swimming, however, she becomes a huuuuge snake monster. To the already frightened monk, this is just one more reason to run. As he reaches the Doujouji temple, he asks the abbot to be hidden inside bell. The abbot, seeing the snake, agrees and thus the bronze instrument is lowered onto Anchin. Kiyohime, however, smelled him all the way to the bell. Coiled around it, she belched flames ou of her mouth (or got her own scales on fire, according to some versions) and melted the bell down, with Anchin iside it, finally attaining her revenge. Also, regarding the execution of the piece. The point behind it was to "risk". I used colors (what I personally don't like), and several differente schemes with them. I chose a very strong contrast in some points, such as the body-kimono color contrast. For the sky and the water I worked with degrades. The sky, however, uses different colors, while the water is worked only in different tonalities. The linework was done using Japanese calligraphy pens, which resemble the ink and brush trace very much. Finally, for the kimono pattern. This might not come as relevant to many, but personally, I liked it for a simple reason: I managed to mix geometric and organic patterns (lotus x triangles) with a very vibrant color scheme on top. Lastly, this is a (VERY) belated birthday present to Pwinkitchi! aww how cute ! apparently I forgot to comment on your stuff, been so busy here lately :( but upon looking at this it reminds me a lot of okami in style, I rather like the coloring you used as well, good job !